This tool allows to create or upload php routines that can be reused in various applications of the project or other projects, depending on the level of access that they were saved. There are three types of access levels that can be used. User - Only for the user that created the script will have access. Project - All the users linked to the project will have access to the script. 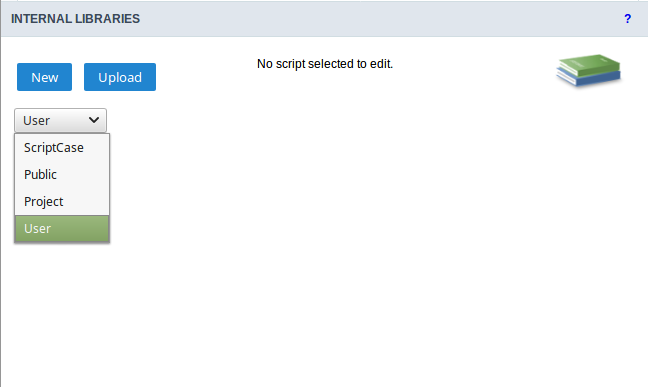 Public - All the users from ScriptCase will have access to the script. You can’t create or modify scriptcase that are in the Scriptcase Level, the scripts from this level are available to be used but nor modified. 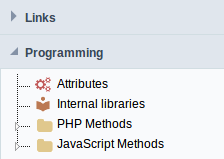 The item Internal Libraries are accessed from the tools menu. Select the level that the script is being saved, in this example the user level was used. Next, inform a name for the file, place your code and save it. To use the Scripts, firstly you need to enable them in the applications that you want to use. All the libraries that you have access will be listed, just select the the ones you desire to enable and use them. To use the libraries, you need to import them by using the macro sc_include.